Mike Tomlin isn’t coaching for his job this weekend. But he should be. Even if the Steelers lose to the hapless Cleveland Browns on Sunday (which would complete one of the great Steeler collapses in recent memory after losing to similarly struggling Baltimore last weekend) Mike Tomlin’s job is safe. That’s how the Steelers operate. The organization hasn’t fired a coach since Chuck Noll took over for Bill Austin in 1969. But I had to couch that last paragraph a little bit. I stated “one of” the great Steeler collapses in recent memory because Tomlin has already been in charge as two other seasons came off the rails in ignominious fashion. In 2007, the Steelers dropped four of their final five games including a home playoff defeat against Jacksonville. And in 2012 the Steelers lost three times in December (including twice at home) to miss out on the playoffs. Judging by how the national media talks about the Steelers, it’s as if those truths aren’t ever acknowledged. The Steelers are perpetually viewed as a model of consistent excellence and stability. Since 2010, the stability has continued. But the excellence has not. In fact the numbers listed above indicate the Steelers have been just above average for the last four years. If that’s ok for the Rooney family, then by all means…stick with Tomlin and ride it out. Keep your fingers crossed and hope that it turns around under Tomlin the same way it did under Bill Cowher (who by the way never went more than three years without a playoff victory or appearance). But the recent track record indicates that Tomlin is more likely to continue being the coach we’ve seen since that last Super Bowl appearance in 2010, than the coach he was leading up to it. The biggest reason to consider firing Tomlin is his inability to maximize his talent when losing to inferior teams. Tomlin defenders would suggest Kevin Colbert hasn’t drafted or signed quality talent as well as he had prior to 2010. That may be true. And, yes, Colbert’s job should be evaluated as well. Yet consider this following number for Tomlin, which is perhaps the greatest indictment against him retaining his job. He’s already lost 25 times (24 regular season, one post season) to teams that finished .500 or worse. Every one of those losses occurred over the seven seasons in which the Steelers failed to win a playoff game under his stewardship (in the two Super Bowl seasons under Tomlin, Pittsburgh lost four regular season games both times. All of those losses came against teams .500 or better). So, in other words, maybe just one extra win against a team on your level (or very often much worse), and you get in the playoffs or improve your seed to get a bye &/or a home game. These repeated “out of nowhere” losses can no longer be ignored. Because they hardly come out of nowhere. And worst of all, they’ve gotten in the way of getting the most out of Ben Roethlisberger’s time as quarterback of the Steelers. That isn’t to absolve Roethlisberger of blame in those games. He’s been bad in many of them. But Tomlin defenders try to make it sound as if Big Ben has played down to the same level as his team every time they’ve been upset. That’s patently false. So more than 1/3 of those bad losses, the QB couldn’t be blamed. Unless of course you feel like blame should be pinned on the quarterback with an average of 27/41 for 338 yards and a TD/INT ratio of 21/7 in those contests. Tomlin has often been asked about his team’s frequent losses versus below average competition. He’s never given a direct answer as to why he thinks it keeps happening. Before the Raven game he blew off a suggestion that he needed to address the team about the trend. “I wont. I’m sure you guys (the media) will,” he dismissed. James Harrison said the defense came out flat in Baltimore. Tomlin merely let Harrison’s opinion stand on its own when was he asked if he agreed with the veteran linebacker, stating “That’s his opinion. I’m not going to piggyback or comment on it,” merely offering Baltimore’s early 4th down stop as a potential reason why. This criticism of Tomlin isn’t offered as a negative commentary on his whole career. He was a good hire who deserves all the compliments that came along with being a two time Super Bowl participant and one time champion. He’s a good coach. But he’s also one who isn’t getting the most possible out of a rare commodity in sports…a window open for an elite quarterback (for other recent QB playoff rate comparisons click here). And he is also one that doesn’t seem to get consistency from a team that, in his own words, “is good enough to beat anybody.” For those reasons Art Rooney II should be giving serious consideration to making a change if his club loses to the wayward Browns Sunday (which would render the Jets/Buffalo outcome meaningless). And for those asking who should the Steelers hire instead…well, I don’t know. But if you’re a fan of Tomlin’s ask yourself this: Did you even know who he was two weeks before Cowher retired at the end of the ‘06 season? 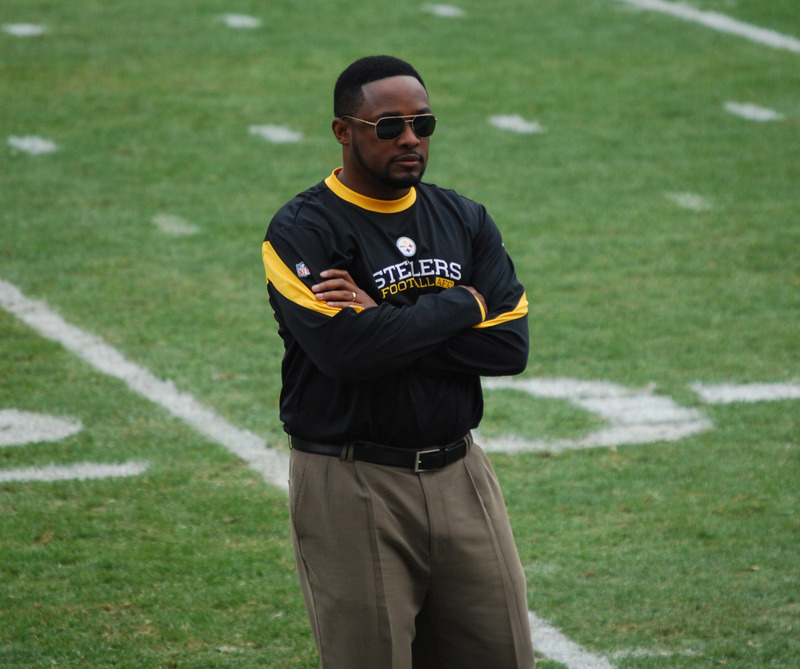 Maybe the next Mike Tomlin is sitting out there right now, and we don’t even know who he is. And I do intend that to be a compliment.